Crime Scenes and Folk Saints: The Cult of Santa Muerte (Note: open as a WORD document) by Tony Kail. This paper discusses the contemporary discoveries of an obscure folk image known as ‘Santa Muerte’ or ‘Saint Death’. Images found in statue, tattoo and printed form are being discovered at crime scenes and on the person of organized criminals. The mythology surrounding Santa Muerte reflects a bond between the deity and followers who identify themselves as social outcasts including criminals. This paper will discuss the origins, mythology and discovery of this icon. Sources include interviews, press reports, Internet articles and literary works. 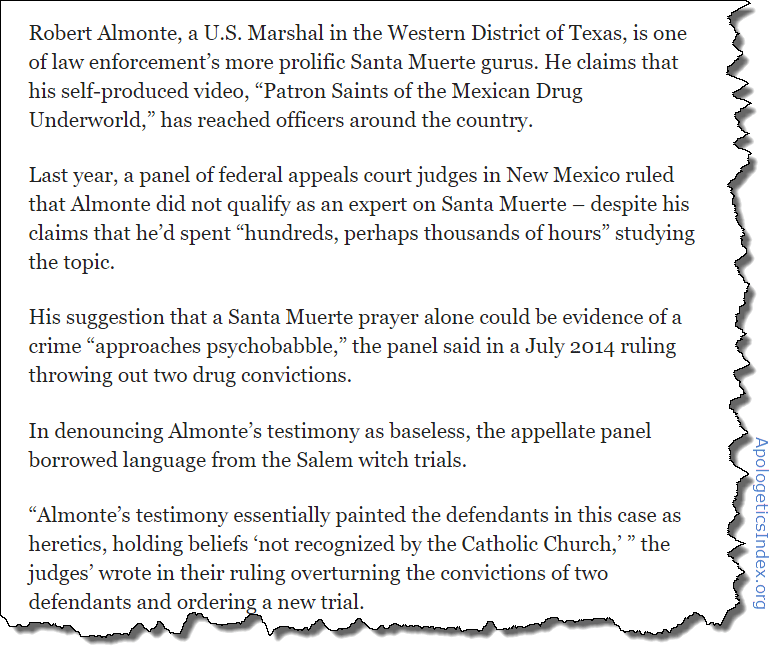 Modern-day witch trials: Law enforcement target Mexican folk religion, Matt Smith, Reveal — The Center for Investigative Reporting, Oct. 16, 2015. The ‘Satanic Panic’ of the 1980s has been replaced by a new kind of moral panic over Santa Muerte, religion professors and researchers say. Particularly among US law enforcement services, the practice of Santa Muerte is often seen as evidence of possible wrongdoing. The Narco cult of Santa Muerte by Tony Kail. Members of narco-terrorist groups frequently surround themselves with cultural trappings that endorse the philosophies of the narco-terrorist mindset. Presently there is an entire ‘narco-culture’ that embraces a lifestyle of violence, death and indulgence. One of the most popular visible icons found among members of this deadly culture is a figure known as ‘Santa Muerte’. Santa Muerte as a spiritual icon has been frequently found among members of three of Mexico’s major drug cartels: Gulf, Sinaloa and Juarez as well as the Los Zetas. The use of spiritual icons as a means of psychological warfare is a technique that is as old as time. Early history demonstrates that the use of grim images in warfare gives those that use these techniques a psychological ‘edge’ over their enemies. Like the ‘Jolly Roger’ flags of seafaring pirates, the Santa Muerte image communicates to outsiders that the owner does not adhere to modern laws of the land. Santa Muerte: Inspired and Ritualistic Killings By Robert J. Bunker, Ph.D., FBI Law Enforcement Bulletin, February 2013. Criminal insurgencies waged by the drug cartels and gangs in Mexico have received much attention and debate. Far less has focused on some of the darker spiritualistic parts of the drug wars. One component entails the rise of the cartel and gang narcocultura (drug culture) variant of the Cult of Santa Muerte (literally translated as “Holy Death”).2 This variant of the cult promotes greater levels of criminality than the more mainstream and older forms of Santa Muerte worship. Sometimes it can be so extreme that it condones morally corrupt behaviors—what many people would consider as resulting from an evil value system that rewards personal gain above all else, promoting the intentional pain and suffering of others, and, even, viewing killing as a pleasurable activity. While addressing the rise of such dark spirituality requires a balanced perspective (e.g., avoiding a repeat of the Satanism scare of the 1980s), enough ritualistic behaviors, including killings, have occurred in Mexico to leave open the possibility that a spiritual insurgency component of the narcotics wars now exists. Santa Muerte is no saint, say Mexican bishops by Martin Barillas, a former US diplomat, who also worked as a democracy advocate and election observer in Latin America. Catholic Church authorities concur that Santa Muerte seeks to lull the uninformed into believing that the cult represents an authentic form of Christianity. Apparently lending credence to this assertion, Santa Muerte cult spokesman Romo has spoken of himself to the press as “bishop” and further emulates the Catholic Church by wearing garb typical of Catholic clerics. Romo and other “priests” of Santa Muerte even hear confessions, but espouse a theology at odds with any recognizable form of Christianity. Reuters news service helped along the farce by referring to Romo as a “Catholic” priest, while the Mexican newspaper “La Reforma” refers to the cult as “Catholic, albeit not Roman”. Troubled Spirits By Alma Guillermoprieto for National Geographic, May 2010. Unknown to most Mexicans until recently, this death figure resembles medieval representations of the grim reaper but is fundamentally different from the playful skeletons displayed on Day of the Dead—the day when Mexicans’ departed loved ones return to share with the living a few hours of feasting and remembrance. Her altars can now be found all over Mexico, on street corners and in the homes of the poor. Women and men alike are her followers. In the heart of Mexico City, in a neighborhood that has always been raucous and defiant, Enriqueta Romero leads a prayer session in honor of the skeleton every first of the month. Simultaneously flinty, foulmouthed, and motherly, Romero was among the first and the most effective propagandizers of a cult that some believe got its start in towns along the Gulf of Mexico but now covers a wide territory up and down the country. In California and Central America as well, young people light candles in La Santa Muerte’s honor and tattoo her image on their skin in sizes small to extra large. A few years ago the Interior Ministry revoked its registration of La Santa Muerte as a legitimate religion, to no effect. Newsstands sell instructional videos showing how to pray to the saint, and even chic intellectuals are beginning to say that the cult is muy auténtico. have already won their war against the Mexican state. Devoted to Death: Santa Muerte, the Skeleton Saint By R. Andrew Chestnut, one of the world’s leading researchers on Santa Muerte. Although condemned by mainstream churches, this folk saint’s supernatural powers appeal to millions of Latin Americans and immigrants in the U.S. Devotees believe the Bony Lady (as she is affectionately called) to be the fastest and most effective miracle worker, and as such, her statuettes and paraphernalia now outsell those of the Virgin of Guadalupe and Saint Jude, two other giants of Mexican religiosity. In particular, Chesnut shows Santa Muerte has become the patron saint of drug traffickers, playing an important role as protector of peddlers of crystal meth and marijuana; DEA agents and Mexican police often find her altars in the safe houses of drug smugglers. Yet Saint Death plays other important roles: she is a supernatural healer, love doctor, money-maker, lawyer, and angel of death. She has become without doubt one of the most popular and powerful saints on both the Mexican and American religious landscapes. Video: Dr. Chesnut discusses his book. Santa Muerte: Mexico’s Mysterious Saint of Death by Tony Kail. Santa Muerte: Mexico’s Mysterious Saint of Death is a collection of history, folklore and accounts surrounding the saint of death. This easy to read overview of the Santa Muerte culture features stories of paranormal activity, legends and folklore and eyewitness accounts. The book also includes over fifty photographs of artifacts, ceremonies and shrines dedicated to Santa Muerte. One of the features that make this book so unique is the focus on the saint of death in pop culture. The book features a collection of Santa Muerte themed fashion, music, books and cinema.